For the last several weeks, I have woken up to Sponsored Ads on Instagram that have caused my digital media marketer’s hair to frizzle up. Though the solution to my follicle conundrum was solved by the product the ad was trying to push, the larger issue remains: I’m neither a female nor someone interested in female hair products. 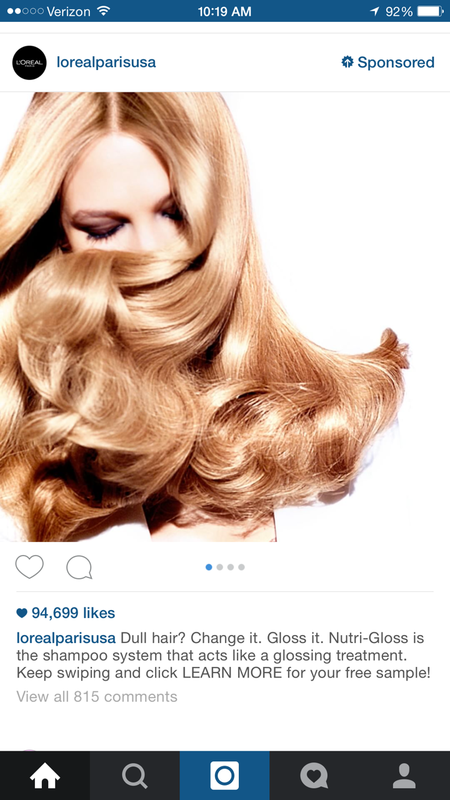 I don’t know how much L’Oreal paid to blast this ad across the vast picturesque world of Instagram, but judging by the numbers quoted in the press (and what I have heard directly), it could range from $75k upward to $1M. Targeting – it’s the premise on which Internet advertising was built. From time to time, we have new entrants into the mix, like Insagram, who refuse to play by the rules. Their counter-argument to our request for targeting is vague and usually has something to do with their platform being aspirational, a canvas for stories and brand building. It’s not, as sales rep hasten to remind media buyers, a direct response medium. Targeting correctly is not a requirement for DR campaigns. It’s a requirement. Period. When your digital platform has crappier targeting than a TV network, you are going to lose money to the big screen. Or you should, at least. I don’t know if my experience with L’Oreal is work of Instagram’s targeting non-algorithm or of someone on the agency side who is not doing a good enough job of setting audience parameters, but there are thousands of dollars being wasted in the process.